Etiology of maxillomandibular fractures is varied from road traffic accidents, interpersonal trauma, and pathological fractures to intentional iatrogenic causation for orthognathic surgeries. Each of these fractures produces different pattern, depending on several factors including direction of trauma, age, gender, and host of other factors. Owing to complexities, the treatment and approach are also diverse.,, The most preferred method of treatment in most, if not all cases are that of open reduction and internal fixation (ORIF). This procedure necessitates the use of biocompatible screws that primarily aid to stabilize the plates used in the ORIF. Use of ORIF minimized the risk of injury to surgeons, decreased operative time, and helped to have better oral hygiene in the convalescent period. Several types of screws such as predrilling, self-drilling, and miniaturized screw for plates were proposed and integrated into to clinical practice. The early reports of the tooth injury were reported in the past decade of the 20th century in literature, and since then a series of literature began to emerge.,,, The nature of tooth injury varied from damage to root substance, strangulation of pulpal and periapical tissues, infections of periapical-periodontal spectrum, root fractures, and even loss of tooth. Occurrence of osteomyelitis in such a situation has been reported recently. If to occur, the damage to tooth from ORIF depends on several factors including but not limiting to the etiology and nature of trauma. There are limited studies performed in this part of the world that describes the effect of the ORIF screws on dental structures. This study was undertaken to address the lacunae and possibly estimate the difference in the occurrence of tooth damage during or after ORIF between trauma and planned osteotomies. This was a retrospective setting done based on archival case records of the author's center. The author has more than three decades of clinical experience as a trained specialist in treating facial fractures. The present study included all cases that had been operated for maxillomandibular fractures, either as a treatment as in case of fractures or after orthognathic surgeries during the period of 2011–2015 (both years inclusive). From the records, details of patients, clinical examination, and radiographs were collected. They included the patient demographics, nature of fracture, treatment provided, and placement of plates and screws. From the radiographs, clinical examination records, and follow-up during later clinical/radiographic examinations, the outcome in case of complications was noted down [Figure 1],[Figure 2],[Figure 3],[Figure 4]. One single examiner (author) performed all radiographic and clinical analyses. The inclusion criteria included all cases with complete records for at least 1 year postoperatively; patients with permanent dentition; and patients with fractures involving ORIF in tooth-bearing areas only were considered. The exclusion criteria included patients with deciduous or mixed dentition; patients with incomplete records or <1 year follow-up; patients with severely deformed occlusion/tooth position that may interfere with the screw positioning; patients requiring additional grafts/tissue engineering materials; edentulous patients, patients with pathological, comminuted, and/or panfacial fractures were not included and any screws applied in a toothless/edentulous space were excluded in the screw count. The center follows the ORIF technique in cases of fractures and for orthognathic surgeries unless complexity of deformity demands more complex addendum such as distraction osteogenesis., In several other cases such as critical size rehabilitation, as it happens with pathological fractures use of the grafts or tissue engineering products, they were not included in this study. After adequate clinical examination and imaging studies, the patient was prepared for ORIF using standard procedure. The surgical treatment plan was influenced by a lot of factors including the extent of the fracture, association with nontooth bearing areas, age, gender, and preexisting medical complications. The center employs drill-free, self-cutting, and self-tapping bone anchor screws (Synthes Inc., intermaxillary fixation (IMF) screws, 2.08–12 mm, Monument, CO, USA; Stryker Leibinger maxillomandibular fixation screws 2.08–12 mm, Freiburg, Germany). Standard incisions and approach as per the treatment requirement were done and the bone fragment approximation performed accordingly. Tooth in line of fractures was extracted or preserved as the situation warranted and has been discussed earlier., Confirming to standard prescribed procedures, all screws were inserted between dental roots, as required in case of fractures or below the apices of root apex by a transalveolar approach in cases of orthognathic surgeries. During surgery and the immediate postoperative period, temporary IMF was achieved using wires/arch bars to achieve and check favorable occlusion that was then removed, replaced with elastic bands, and later discontinued. The screws and plates were retained for several weeks unless there is a sound justification for immediate removal. Appropriate antibiotics and nonsteroidal anti-inflammatory drugs were provided. Strict oral hygiene measures were instituted and same stressed during periodical reviews. For the purpose of this study, the following predictor variables were considered - age (in years), gender, nature of fracture (trauma or orthognathic), tooth involved (molar/premolar/canine/incisor), and jaw (maxilla/mandible). The outcome variable was measured for each of the screws that was employed for ORIF in tooth-bearing areas. For each patient, the individual screws used were assessed for outcomes as no contact or when a screw impinge on the root (”potential hit”) or a hit with clinical and/or radiological sign of damage at 1 year follow-up. All the collected pertinent data were entered and analyzed using Statistical Package for Social Services (SPSS, version 18.0.1, IBM, Chicago, IL, USA). The descriptive data for the variables were presented. The difference between the no contact, potential hit, and damage in the orthognathic and trauma group was presented using Chi-square test. P ≤ 0.05 was considered statistically significant. 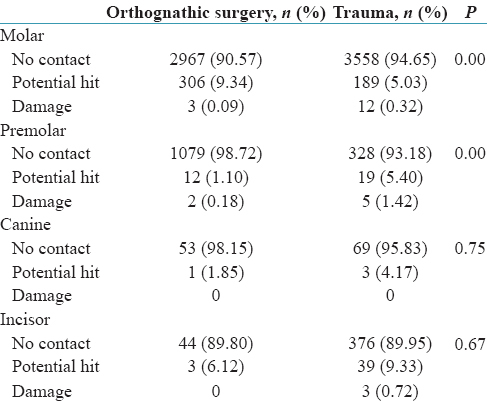 There were 1632 patients fulfilling the inclusion and exclusion criteria and formed the study group, of which 663 were in orthognathic surgery and rest in traumatic fracture. Of the 663 treated with orthognathic surgery, 210 had bimaxillary orthognathic surgery as treatment option whereas the rest had either maxilla or mandible treated. In the trauma group, 358 patients had fractures involving both jaws whereas 272 had maxilla alone and 339 had mandibular fractures alone. The mean age of the patients was 27.3 ± 12.56 years and the age range was 12–68 years. The mean age of orthognathic group was 22.11 ± 8.33 years whereas, for the trauma group, it was 29.23 ± 13.28 years. The difference was statistically significant (P = 0.01). 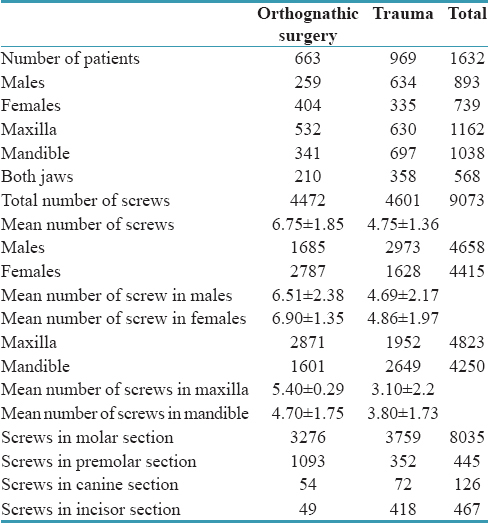 The mean number of screws for orthognathic surgery per patient was 6.75 ± 1.85 whereas, for trauma cases, it was 4.75 ± 1.36. The difference between the gender and jaws is shown in [Table 1]. The difference was statistically significant (P ≤ 0.05). On comparing the outcome, of the 9073 screws studied, 93.40% were not involved in any contact with the teeth, 6.3% were in category of potential hits (near apices or the root surfaces), and only 0.28% had evidence of root damage with the screw. There were 597 teeth that were associated with potential contact of screw with roots. The type of tooth and the surgery are compared in [Table 2]. It is observed that molar and premolar had a significant difference in terms of the type of surgery (P ≤ 0.05) while canine (P = 0.75) and incisor (P = 0.67) showed no statistical difference. Existing literature shows that damage to tooth during placement of screws for plates as it happens in ORIF during fracture reduction as well as orthognathic surgeries.,,, There are certain areas of jaws that are more prone for such tooth damage. The position of the tooth, type of plates, and/or screws have been traditionally cited as factors that influence the damage to tooth during screw placement. Recent evidence points other factors such as position of the surgeon, experience of the surgeon, and the dominant or operating hand side of the surgeon affects the outcome. Systematic reviews done in this regard points out that emanating evidence from literature is not sufficient to draw a meaningful conclusion. The present study was done to assess the extent of damage to the tooth structures during fracture reduction performed by an experienced surgeon using a conservative protocol for screw placement. The center employs a policy to select the screw placement only in a nontooth-bearing region, especially below the apices of root. Introduction of the advanced diagnostic modalities such as cone beam computed tomography (CBCT) has facilitated careful studying of dental structures during treatment planning. The period the present study coincided with the introduction of CBCT into clinical practice in India. In addition, the observation noted from operative notes and author's experience is that when the bone in which the plates/screw is placed is thinner, there has been a chance of potential contact or damage to the root. This probably is due to the surgical scenario that the operator in an attempt to secure sufficient anchorage/stability for the screw places them in cancellous bone where the chance of the “wobbling” of the screw, decreased tactile sensation contributes to the increased risk of the root damage. These observation needs to be studied in detail in further studies. The present study sample in orthognathic surgery group showed higher female preponderance while the trauma cases had more of male preponderance which is similar to previous literature. Orthognathic surgery is performed on both sides of jaws unless it is a unilateral deformity and would thus require more plates hence more screws. This is established in [Table 1]. The orthognathic surgeries use controlled force to create the fracture lines that are often favorable and hence stabilization can be achieved much easily. Furthermore, the surgeon can harness the Champy's lines effectively to repair and stabilize the reduced fractures. On the other hand, traumatic fractures have diverse pattern and would require customization of approach and plating principles. Strict adherence to principle of fixing screw below root apices, as it can be best adhered in orthognathic surgery than in fracture reduction. In fracture reduction, the customization of placement of plate would require the placement of screws in the root region. Hence, in the present study, it is observed that there were more incidences of root damage and chance of potential contacts in traumatic fractures rather than the orthognathic surgeries. Literature reports of tooth damage to the extent of greater than 12.5%, up to 17.1% of all involved teeth have been reported. Contrary to these reports, the present study findings are that only 6.58% of teeth had a chance to get involved with the root damage and only 4.19% of them exhibited clinical and or radiological evidence of damage of the root apices. In orthognathic surgery patients, in this cohort, the premolars were the teeth that were commonly involved. This emanates from the probability that the osteotomy cut is in the region of the first premolar which is often removed during the step-back orthognathic procedures. This is in accordance with the report of Hartwig et al., who reported nonconfirmation to the proposed safe and danger zone of tooth damage from CBCT studies. With increasing use of screws, the results need to be interpreted with caution. In cases of fractures, especially involving the zygoma and comminuted fractures of the maxillofacial region, the difficulty in operating site and access to fracture site permits the placement of screw in unfavorable position unfavorable position. This might lead to screw potentially impinging on the roots of the tooth. Unless the surgeon accounts for the same during model study, intraoperatively, the chances of a potential contact of screw with root are high. The same has been reflected in [Table 2] with statistical significance. In case of orthognathic surgery, the placement of screw in the molar region is often in the region of the first molar, whereas in traumatic cases, it depends on the fracture pattern, which is beyond the control of the operator. The present study did not take into account of the length of screws employed for the surgery. The length of the screw is another potential factor that could alter the potential contact or damage to the root structure. In a bid to secure the fracture site, longer screws are often clinically preferred. This practice needs to be curtailed. Furthermore, the present study did not consider the extent of damage and survival of the tooth. In summary, the incidence of surgeon mediated root damage and/or injury is not uncommon in orthognathic and traumatic jaw fracture treatment. The incidence of such root damages is more common in fracture ORIF than orthognathic cases. The outcomes of the damage are often self-limiting, and long-lasting noxious effects are negligible. Author's approach to ORIF causes fewer incidences of potential root contact and possible root damages. Large-scale study accounting for more confounding factors is necessary to identify the benefits of the surgical approach. Clinically or radiologically evidence of root hits and those with evidence of potential hits should be followed up to detect any negative outcome and appropriate dental treatment instituted, if necessary. Hartwig S, Boettner A, Doll C, Voss JO, Hertel M, Preissner S, et al. Drill-related root injury caused by intraoperative intermaxillary fixation: An analysis of 1067 screw applications. Dent Traumatol 2017;33:45-50. Rowe NL. The history of the treatment of maxillo-facial trauma. Ann R Coll Surg Engl 1971;49:329-49. Mukerji R, Mukerji G, McGurk M. Mandibular fractures: Historical perspective. Br J Oral Maxillofac Surg 2006;44:222-8. Borah GL, Ashmead D. The fate of teeth transfixed by osteosynthesis screws. Plast Reconstr Surg 1996;97:726-9. Schneider AM, David LR, DeFranzo AJ, Marks MW, Molnar JA, Argenta LC. Use of specialized bone screws for intermaxillary fixation. Ann Plast Surg 2000;44:154-7. Hartwig S, Doll C, Voss JO, Raguse JD. Severe tooth loss after root damage caused by predrilled intermaxillary fixation screw: A case report. Dent Traumatol 2016;32:425-7. Fabbroni G, Aabed S, Mizen K, Starr DG. Transalveolar screws and the incidence of dental damage: A prospective study. Int J Oral Maxillofac Surg 2004;33:442-6. Balaji SM, editor. Orthognathic surgery. In: Textbook of Oral & Maxillofacial Surgery. 2nd ed. New Delhi: Elsevier; 2013. p. 713-8. Balaji SM, editor. Maxillofacial trauma. In: Textbook of Oral & Maxillofacial Surgery. 2nd ed. New Delhi: Elsevier; 2013. p. 825-976. Balaji P, Balaji SM. Fate of third molar in line of mandibular angle fracture – Retrospective study. Indian J Dent Res 2015;26:262-6. Samson J, John R, Jayakumar S. Teeth in the line of fracture: To retain or remove? Craniomaxillofac Trauma Reconstr 2010;3:177-84. Alves M Jr., Baratieri C, Araújo MT, Souza MM, Maia LC. Root damage associated with intermaxillary screws: A systematic review. Int J Oral Maxillofac Surg 2012;41:1445-50. Widar F, Kashani H, Kanagaraja S, Dahlin C, Rasmusson L. A retrospective evaluation of iatrogenic dental root damage with predrilled vs. drill-free bone anchor screws for intermaxillary fixation. Dent Traumatol 2012;28:127-31. Purmal K, Alam MK, Pohchi A, Abdul Razak NH. 3D mapping of safe and danger zones in the maxilla and mandible for the placement of intermaxillary fixation screws. PLoS One 2013;8:e84202. Singaram M, Vijayabala SG, Udhayakumar RK. Prevalence, pattern, etiology, and management of maxillofacial trauma in a developing country: A retrospective study. J Korean Assoc Oral Maxillofac Surg 2016;42:174-81. Balaji SM. Impacted third molars in sagittal split osteotomies in mandibular prognathism and micrognathia. Ann Maxillofac Surg 2014;4:39-44.